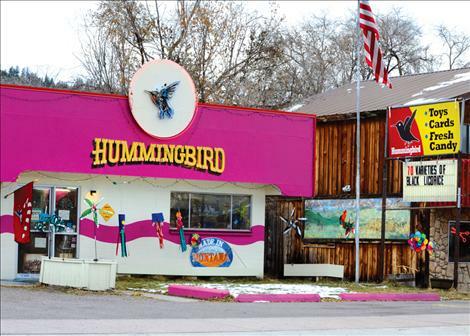 Bright colors, whirligigs and 70 flavors of black licorice draw visitors to the Hummingbird in Arlee. 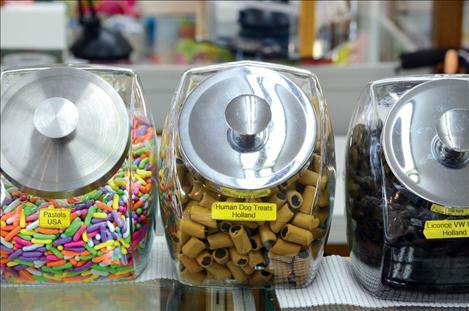 ARLEE – Jars of candy with names like Candy Chalk, Salty Dog Treats and Chocolate Rocks line the shelves and counters in a small building called the Hummingbird, which is the perfect place to get a candy stash for the holidays. Shop owner Tony Hoyt gives customers coming in the door what he calls the 15-second candy tour. “Black licorice is here,” he said pointing towards a counter with the majority of the black licorice. There are 70 kinds of black licorice throughout the store in varying flavors and shapes including itty-bitty sugar free black licorice bears. Customer Lori McCarthy agreed with Hoyt that the best way to eat the black licorice pinwheels was to unwind them. “Black licorice is my favorite,” Hoyt said. Hoyt pointed to where the fruit licorice in pineapple yellow could be seen beside the jar of green apple licorice along with the jars of gummies like cola bottles, exotic frogs, dinosaurs, white grapefruit slices, piglets and not-flathead-cherries. The assorted chocolates, including bear paws with nut shaped claws, were under the glass counter. The candy is sold by weight and most of it comes from Europe. Local Tim Wheeler picked out two kinds of licorice. In 1988, Hoyt opened the candy shop. 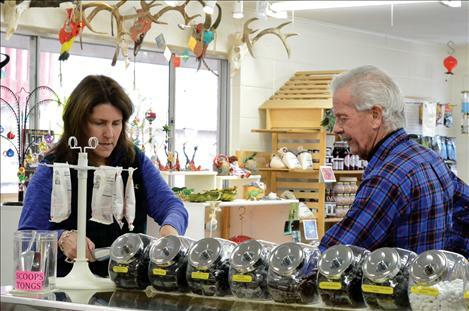 “This is the oldest continuously owned business in Arlee,” he said. Children inspired him to open the business. Last year winter was tough on business. Hoyt thinks his business has lasted so long due to signs and unique products. “We have a sign that says 70 kinds of black licorice. People see that sign and it’s so crazy to them that they want to stop just to see if it’s true,” he said. Other items in the store include cards, huckleberry products, knitted hats, insect jewelry and beadwork — and windmills, which can be seen spinning in front of the shop. Advice also attracts people to the shop. The only problem people have with filling their bags with candy is remembering what they put in them. People have sent pictures of candy they got from the store, asking what a specific piece was so they can get more. The shop is open from 10 a.m. to 5 p.m. most days.